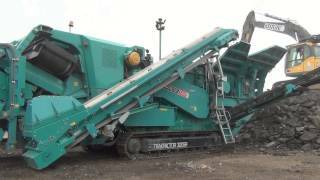 The range includes two models of jaw crushser; the Powerscreen Premiertrak 300 with hydraulic adjust and the Premiertrak R300 with hydraulic release. On both jaw crushers, user benefits include hydraulic crusher setting adjustment for complete and speedy control of product size and overload protection to prevent damage by foreign objects in the crushing chamber. Both models are also on a robust track chassis for onsite mobility and for a quick set-up time. 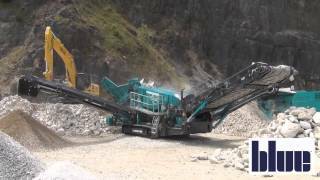 The highly efficient Powerscreen Premiertrak 300 jaw crusher can run at low engine RPM giving excellent fuel consumption and low noise emissions which is beneficial in built up areas. Capable of upto 280tph production, the Premiertrak has been designed with maintenance accessibility in mind to minimise downtime. One of the features of the machine includes the hydraulically lowering conveyor for excellent access to minimise downtime in the case of a blockage. Additionally there are large clearances in the bypass chute to enhance material flow and reduce the chance of blockages with the crusher when processing sticky or difficult materials. A further maintenance feature is the large under crusher clearance and full tunnelling to reduce the chance of blockage due to re-bar build up.